$10 for an hour bus ride. $20 for dorm accommodations. US restaurant prices. Activities or entry fees starting at $15. This country does not scream cheap at all. Don’t fret! There are ways to keep your costs low. I’ll be laying out all my costs in USD throughout my 3-week trip in New Zealand here and letting you know how you can save during your trip. Yes, with the flight I’m way over my daily goal of $30. I had to get from one continent to the other somehow. So, I don’t think I did too bad. My budget should balance out when calculating the overall world trip average. Anyways, let me start advising how to save money in this country, beginning with my biggest wallet eater: transportation. Getting around in New Zealand is not cheap. InterCity is the only “economic” city to city bus company. Having a monopoly, the bus rides don’t come cheap. There is also a hop-on-hop-off bus company, but the cheapest route option on both islands without discounts is $670. That’s 3 times as much as I spent overall on transportation. The hop-on bus is also called the f*uck bus, because mostly party people are utilizing this service, are constantly drunk, and looking for a bed partner. Some party dudes I met, had to call the quits after 7 days because they couldn’t handle constantly being drunk, nor spending that amount of money on booze all the time. Instead of riding the bus or renting a car for $12 a day, you can attempt hitchhiking. With a sign in hand, I’d wait less than 10min to get picked up. Hitchhiking is relatively safe here and most people report short waiting times. Not feeling risky, I’d also recommend using transfercar to find free/cheap relocation vehicles. Vehicle rental companies sometimes need their vehicle moved to another location for a paying renter. Instead of hiring a driver, they let an average Joe with an appropriate license move the vehicle for them for free/cheap. Some of these contracts come with extra perks, such as gas money, paid toll roads, paid ferry tickets, etc. Always carefully read through the contract details. After you get your car set up, get people to help you with gas money. I wish I would have done this, but being overwhelmed with the rental situation, getting extra riders didn’t dawn on me at the time. I did successfully do this in Australia though. Ask around in your hostel if people are going your direction. If you are using Couchsurfing (to stay with a local for free) or utilize free campsites if you got a campervan, then maybe try emailing hostels to post your ride offer or go online for help. Though New Zealand has many free carpool websites, I couldn’t find any that had more than 2 posts on them. Doesn’t mean that you can’t try posting on them. You never know. Facebook groups dedicated to rideshares will probably be a better bet. Now, you can be nice and evenly split the gas cost or you can charge half of the bus fare. You could also try to find a ride for yourself instead of offering one. I used coseats in Australia (also available in New Zealand) and found that the automated charge posted was around half of the gas price while driving campervans. If you get 2 other people, then your gas is taken care of. Heck, you could even make extra money this way if you get more than 2 passengers. It’s a win-win. You get a free ride and they pay way less than they would with a bus. Only down side is that you might have to go out of your way to pick the people up and drop them off at their different accommodations. Towns aren’t that big, so hostels are probably not that far from each other. Hostels aren’t cheap. A dorm room will cost around $17 rarely providing breakfast. Free Wi-Fi is not a given in hostels either, but libraries can get you connected without a purchase. During high season, hostels on the west coast of the southern island sell out 1- 2 weeks in advance. Obviously, I wanted to avoid them. I had a hard time finding Couchsurfing hosts. I would write 20+ personalized requests and if I got a response, they were rejections. I did somehow manage to cover 2 destinations nevertheless. Single travelers will have an easier time finding a host. If you are not solo, then be sure to send quality messages 2 – 3 weeks in advance if you can. If you have a car or a camper, you can also try sending Couchsurfing requests to get a free shower or a parking spot. Majority of the free campsites only provide toilets. Now that you found alternative free sleeping ideas besides a park bench, you need to take care of your stomach. Food doesn’t come cheap. Restaurant prices are like the US. I generally avoided restaurants. When I did go, I’d split a meal with my travel friend. This won’t stuff you, but I liked trying new dishes. Luckily, the food here isn’t all that different from the USA. Instead of restaurants, I bought groceries and cooked. Ask for a free tourist clubcard at New World Grocery Store to get discounts at check-out. You can click here to see cost of goods. Be careful of what groceries you get. I saw cucumbers sell at a low of $2.10 and a high of $3.60! There are reasonably priced goods which won’t make you calculate the currency conversion twice. Addressing activities, these will make you reconsider. Except for hiking and a rare free museum, there aren’t too many cheap activities to do here. Out of the 4 activities I paid for, 2 were just for fun. The others I didn’t want to miss. Wai-O-Tapu Thermal park was stunning to walk through, as well as the Waitomo Glowworm Caves. I could have seen glowworms for free. Being a budget cautious, redoing I think I would save a few bucks by checking out the glowing bugs for free in Hokitika. The reduced number of bugs and the constant, talking, picture snapping tourists make the Hokitika location less memorizing, but the point gets across. Anyways, activities can easily add up here. Especially in Queenstown where all the adventure sports are offered for $100+. Negotiating lower prices is difficult, if not impossible. If you can’t pay less, try getting a free upgrade. Meaning, if the 100-meter-high bungie jump sells for $$$, try getting the jump from 150 meters for the same price. If the sales agent is not budging, start walking out the door, and suddenly, the agent has connections. They want the commission. If this trick doesn’t work, you can always return to the shop later if you couldn’t get the upgrade anywhere else. My suggestion is to plan the country out before arrival and see where you want to spend your money, before your cash runs out. New Zealand is expensive and you can easily have your money run dry. However, there are lots of ways to save money. With planning and luck, you could avoid paying for accommodations and only occur minor transportation charges. If you didn’t care about activities besides hiking and nature gazing, then those can be done for free. This might mean that your cost = flight + food + minimal transportation. That’s not bad at all. You can see below how much I spent on the penny (in USD) at all my locations. If you have already been, I’d be interested to know if you had other ways to save money in New Zealand! Please comment below in the commenting section. Here is also another pioneering backpackers’ take on expenses in New Zealand. If you are now ready to tackle the Kiwi land, then happy planning! The exchange rate during my visit was 1 USD to 1.4 New Zealand Dollars. Let’s get this post started with a money saver tip! We successfully dropped off our free relocation van at the Christchurch airport and were ready to take the public bus to our Couchsurfing host’s home. They advised us to avoid the bus station at the airport and instead catch the bus at the station few minute walk outside of the airport. Taxis, buses, Ubers, shuttle services, all charge an extra $3.44 (5 NZD) to pick up/drop off on airport grounds. Ironically, even though we followed their advice went to the outskirt station, the bus still halted at the airport before moving on to the city core. Our free rental car at our free campsite the night before arriving in Christchurch. At the Couchsurfer’s house, we didn’t have long before we took off to the local bike race the family was hosting. The family were all avid cyclers. I curiously observed the effort needed to put on such an event. Roughly 40 bikers, mostly local, attended. I got to hear about how the tracks were created and even stood in as a time caller (meaning that I yell the countdown as cyclists lap). With no instructions, I had plenty of room to improve, especially compared to the guy who called out the next round. Fun to have participated, but I was glad to come down mountain to end the cold, windy weather exposure. Actually, a couple from the race took us to the Halswell Quarry Park after the event. The park is gigantic and excellent for runners and bikers. The park has different collections from each of Christchurch’s 7 sister cities, meaning that that few typical emblematic statues, mini bridges, benches, etc. were erected in each section depending on the country. As a tourist, not much to write home about though. We did get a good view of Christchurch and heard more about the 6.3 magnitude earthquake that severely damaged the city in 2011. A chair memorial is erected in the city center in remembrance of the earthquake. 185 unique, white chairs symbolizing 185 deaths. The aftermath of the earthquake was still visible during our visit. Some buildings still haven’t been fixed, probably due to insurance reasons. Also, city workers were tearing up parts of the road to fix pipes below. After 5 years, the city was missing businesses and services they offered before and a huge population shifted from one side of the city to the other. I heard that before the earthquake, Christchurch was amazing. Personally, I didn’t find too much to do during my visit that was worthwhile. I saw a free art gallery, the park, the remaining earthquake damage, and other regular sights while roaming the city. We tried to locate a movie theater, but all the ones we went to were no longer there due to the earthquake. The city had some lovely spots, but more geared to locals and not tourists wanting to see something new or exciting. During my visit, I often wondered how Christchurch was before the earthquake destruction. Not only was the city in recovery, but 3 days after my departure of New Zealand, a bigger 7.8 earthquake hit nearby the city! I was lucky to be out of the danger zone. I hope for the best for this city struggling to keep their citizens and economy safe. Predicting the development of this city could be tricky in its current, wobbly state. The first striking point in New Zealand for me was the lack of cars, low population, vast greenery, boundless mountains, and abundant number of sheep on the North Island. (Maybe you can go outside to count actual sheep if you have a hard time falling asleep.) This country is perfect for nature lovers who want to hike their way through a country. There was one hiking path after the other. Some cities were worth checking out, but they weren’t typical cities as many other countries have them. My favorite city was Wellington and favorite town was Wanaka. Excellent vibes. We spent way more time in towns, because there weren’t that many cities here. I was fascinated how the immigrated European population had embraced the Maori natives. The only country that I know of where white people wanted to learn the native language, had respect for the culture, and were interested in protecting that heritage. Mostly due to the beginning how the Maori reacted when whites first landed at their shores. In other colonized countries, the natives have been rejected and neglected, to the point where their bad reputation is pinned on them and not on the oppression that left them no choice, leaving them in an endless cycle of poverty. Though the Maori still suffer from unequal economic and civil rights, their situation is a step in the right direction. 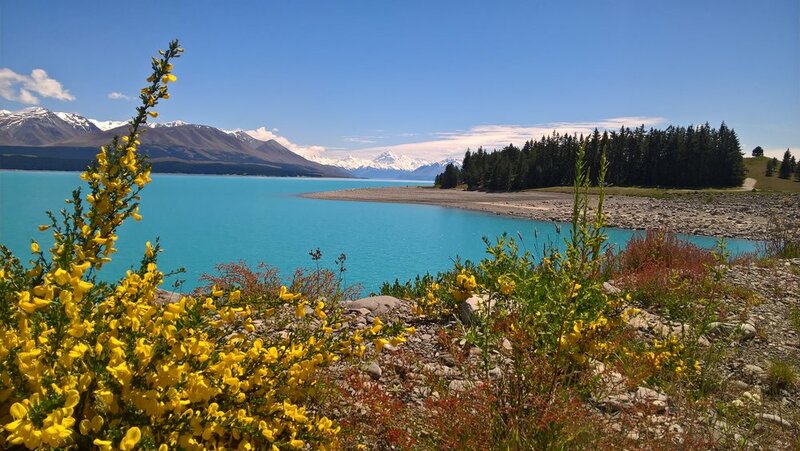 All in all, New Zealand is mainly for nature freaks who want to see some of the best spots nature offers or utilize fantastic terrain for various sports. The crew from Lord of the Rings recognized the countries beauty and shot many scenes in this stunning countryside. Many filming sites are available for sight and tours. Besides landscape, this country doesn’t have much else. So, if you aren’t into the great outdoors, you will probably want to skip this pricier country. If you love the outdoors, you’ll also love New Zealand. The country awaits your visit. Queenstown is the adventure capital of New Zealand. Bungie jumping has been invented here. Not only does the town offer the expensive experience of plunging to the ground secured only by a rope, they also sell many adventure sports known under the sun. Of course, finding a quest under $100 will be hard. Bargaining the price might be tough, but worth a try. If lowering the price fails, maybe go for a free upgrade if possible. What do I mean with upgrade? Instead of paragliding from the lower height, get the higher altitude for the same price. An annoying sales rep stated that the prices were fixed by the company, but as soon as we were about to walk out of the office, he suddenly had connections that could get us the free upgrade. Still ended up walking out. The beauty of traveling around the world is that we can choose to do these expensive activities at locations with more budget friendly price tags. I'm one with the tree. Location: Botanical Garden. Some non-adrenaline pumping activities we did in Queenstown included strolling around the waterfront and the botanical garden. There were a few flowers strategically planted to form a nice formation, but there were even more disk golfers. So, watch out for the Frisbees zooming past your head. Any disks found on the ground are better left alone if you don’t want someone running towards you with a frowny face. Not only did we see the lake from up close, we gained a fantastic bird view of the waters and Queenstown when we hiked Queen Hill. No wonder tourists are drawn to this beautiful town. There are so many tourists, that locals have a hard time finding reasonable rent prices because not enough housing is available. Tons of construction projects are underway, but demand is even higher. Tourists get catered to first since we pay more. In the end, the unfortunate local workers need to drive in from nearby lodgings. We learned this from a New Zealander who drove us from Wanaka to Queensland, because we stood at the side of the street with the universal hitchhiking, thumbs up hand signal. Part of the view from Queen Hill Hike. Queenstown is on the right. In the end the most nerve wrecking thing we did was hitchhiking for our first time. I’ve had hitchhiking on my bucket list, and where better to try it than a country known for safety and hitchhiker friendliness? We heard reports from other backpackers that they were usually picked up within 15-min. A lady stopped for us in less than 5-min. How did we do it? We asked the reception for cardboard and marker, which we wrote our destination on large and legibly. (A sign will help the pickup success rate.) We also stood at a location where cars are going slowly (not freeway), but the road is leading out of town towards the desired destination (ask reception for suggestions). Spots where cars can easily pull over for you are preferred. Looking well-groomed with a smile aids trustworthiness. Who wants to pick up people who appear to not have showered for a week? I saw some of those. Even if the country was relatively safe, we still made sure to talk to the driver before hopping in. Not only did we hitchhike into Queenstown, we also got a free ride out of town to the airport, where we also had a short wait time of 10-min. From the airport, however, we didn’t take a flight as one would expect, but we picked up our free campervan relocation. Not only did we get a free camper for 2 days, but also got a free tank of gas from the company. That’s almost all we needed to drive from Queenstown to Christchurch. We added $11 by Lake Tekapo, and later we got cold feet when the empty gas light came on near our destination and topped up with another $3.5 in gas. On the way to Christchurch, we set up camp by Lake Pukaki. The beyond-belief turquoise lake and the incredible backdrop of snowcapped mountains made this spot ideal to marvel at nature. I was extremely captivated by the sight. We positioned our van ideally to get an unobstructed view as we relaxed in the van. Tranquility at its finest. The only point to consider was that the only thing nearby will be the tourist information at a 20-min walk away. They sold overpriced crackers and fresh salmon. We should have stocked up on food prior, but scraped by with the limited snacks we had. In the morning, we filled our grumbling stomachs by Lake Tekapo. Lake Tekapo is nearly as gorgeous as Lake Pukaki. If you find a free camp spot, this place might be better for overnight camping if you want the comforts of a town, where you can buy whatever your heart desires. With a town, there obviously will be more people around you. There were many “no-overnight camping” signs plastered around the lake, hence getting a lovely spot as by Lake Pukaki will be difficult. Overall, these lakes were ideal midpoint locations for us driving from Queenstown to Christchurch. We had no issues whatsoever getting a free campervan with the tank of gas. Probably because more people fly into Christchurch and then travel to Queenstown because the flight is usually cheaper. I was looking forward to see Christchurch, where a 6.3 magnitude earthquake hit in 2011, 5 years prior to our arrival. I’ve heard a few stories from backpackers while traveling around New Zealand and now I wanted to see with my own eyes. Random Money Saver Tip: If you feel like something sweet, go to Cookie Time. Inside, by the “dining area”, there are I-Pads. After providing your email, “spin the wheel” for free, and be guaranteed to win at least a small cookie or hit the jackpot of a shake (like we did). Franz Josef, a town that boasts of a grand glacier. Well, maybe once this was true, but global warming has changed that status. I’m not here to lecture on the rise in temperatures and how this will be the end of human kind (you should look it up though), but I am here to tell you my impressions of my destinations. And Franz Josef is one of those places you should skip even if you have the time. Waste your time somewhere else. Franz Josef Glacier used to reach down to the valley. Actually, the town has 2 glaciers, Fox glacier and Franz Josef Glacier. Fox Glacier is much smaller, and one can barely see the ice under the layer of dirt. Franz Josef Glacier still has more substance, but doing the 30-min walk to it won’t give you the epiphany of its size. There is a billboard at the site to give you an idea what beauty it once was. A $285 helicopter tour might give you a better idea, but who has kind of money on a budget? We were going to do a 5-hour roundtrip hike, which apparently gives an improved view, but the rain theme kept playing from the days prior. Not wishing to get drenched again, we settled on laziness. We did lose some calories later in the evening when we climbed a random hill slightly removed from town for a view of the surrounding mountains and distant ocean, and our way back to the hostel was lighten up by the Milky Way. The shiny stars I could have seen elsewhere. I guess my problem was that I’ve seen one of the best glaciers on earth, Perito Moreno in Argentina. After seeing that, how could I have been awestruck by what I had seen here? Not only that, even the small grocery store in town sells everything for a few cents more. So, I’d recommend ignoring a tiny town with higher prices but lack of captivating attractions, but move on and spend your time at a place that is at least more scenic. Wanaka was more scenic. That town was up next and was my favorite town in New Zealand. As I had mentioned, Wellington was my favorite city, but Wanaka was my favorite town. Something about the lake gave the place a calm atmosphere. Besides hiking, there was not much more one can do. Even though the attractions are limited, I got a good vibe here. We skipped rocks on the lake (New Zealand has an absurd amount of flat rocks, it’s rock-skipping-haven) and hiked up Mount Iron. From this mountain, the backdrop is gorgeous, 2 lakes and snowcapped mountains. There is another recommended hike that is longer and should have given better views, but we didn’t go. The start of the trail is a 2-hour drive away (mostly because of the rough terrain) and we could have carpooled with the same female we came to town with, but we choose not to. She returned gleaming of its splendor. If our choice was a mistake, I’ll probably never know. We were satisfied with the view we got. Not only did we get a view, but because of our shorter choice we had time to go check out Stuart Landsborough’s Puzzling World, a museum full of mind twists. We saw one thing with our mind, but further investigations proved we were wrong. For example, we saw two shapes rolling on each other, but on second glance, we realized that the shapes were attached together and the piece was rotating as a whole. My favorite section was when the entire room was built at an angle, but the mind saw everything horizontal/normal. The result being, while walking through the room, that the brain couldn’t understand what’s going on, I stumbled while walking, and needed to hold on to items to not fall on my face. The museum also had a maze, which we, of course, finished way faster than the average time. The museum was great for challenging my viewpoint and made me reflect on my life, deducting what else I might be misinterpreting. Would you believe me if I told you I was standing straight? Overall, Wanaka is a nice place to relax and take in some fresh air. It’s also the town where we tried hitchhiking for the first time on our trip. Read about my stranger-danger experience to Queenstown, the adventure capital, in my next post. See you then! Takaka, a great sounding name for a town. There are lots of bathroom-related names up in this area for some reason. We drove up from Christchurch with a red relocation car we got for free. I enjoyed not having to worry about the vehicle size while driving and zipped around the corners faster. We encountered more reckless drivers in this area, who would cut the corners. For the most part, there are barely any cars on the street, but once we almost got into an accident. This speeding guy overtook us around a corner and there was a car in the oncoming lane! Luckily, I have been slowing down already and with seconds to spare, his car came into the correct lane, avoiding a deathly accident. This made me much more cautious around bends for cars which drive into the opposite lane to go around faster. So dangerous! The highest percentage of accidents in New Zealand are due to cars in the wrong lane. The beach at the Abel Tasman National Park. Well, I’m thankful I arrived at my destination. So, what did we do around Takaka? We went to visit the Abel Tasman National Park. Weather forecast predicted rain, which we had been experiencing at the campsite, but we decided to test our luck and drive to the park anyways since we came up all this way just for the park. We indeed turned out to have luck on our side. Right by the park, the clouds started to clear up. Strolling around the beach, we took in the ocean view. Probably because of the weather report, the park was mainly deserted. Got the whole place to ourselves, encountering less than 10 people. Wanting to do a nearby hike, we remove our shoes to cross a river to get to the starting point. A third way through, few raindrops hit my skin. We incorrectly estimated that we were at least halfway through the hike and decided to press on. 15-min away from the car, the floodgates opened. Within seconds I was drenched to the bone (left my jacket in the car like a genius). Had we turned back the way we came from, we would have been sitting in the car before heaven’s blessing. We headed straight back to the campsite, where the sun was peeping through the clouds. Hence, I hung my clothing up to dry outside. Even though we only had a car and not a camper, we still slept in the car at a free campsite. Searching for a free campsite where we could legally stay without being self-contained was challenging, but we got to the best campsite yet. This campsite was located by a river, had a toilet, a table for each spot, a plugin and free Wi-Fi! Was nice being connected again. The park attendant was extremely friendly as well. The first night we were cold while sleeping since we had no blankets. When we returned from our daily excursion, we asked him if he had a blanket we could borrow and he kindly gave us a sleeping bag. The second night still wasn’t a comfortable rest, but at least we weren’t as cold. The weather has been in our favor, but we still saw what we wanted to see in Takaka and drove on to drop our car off in Greymouth. On our way there, we did a lovely pit stop at the pancake rocks. The rocks got this name from their layering, like stacked pancakes. Scientists are still unsure how this formation was created. After this 20-min break we were back on the road. Initially we wanted to stay in Greymouth for a night and check out the town. After our arrival, we realized that Greymouth wasn’t interesting enough and purchased a bus ticket to Hokitika. Hokitika is only 1 hour drive away from Greymouth. In hindsight, instead of purchasing an expensive bus ticket, I would recommend to try hitchhiking that stretch to save money. There was only 1 bus leaving from Greymouth to Hokitika per day and we didn’t want to risk getting stuck in Greymouth for a night since we only had 45-min before said bus departed. Hokitika's beach was not very appealing hangout spot during the rain. Hokitika was a small, quiet town. Not much to do in town, but there are 3 popular things to see here: the gorge, the lake, and the glowworms. If we had a car, we wouldn’t have had a problem getting to the waters. They are a little further out. Some do hitchhike the stretch successfully. We thought we could just walk to the lake in less than 2 hours, but that was not the case. So, we turned back to the hostel since the weather looked grey and forecast predicted more rain. In the evening, we checked out the glowworms, a 15-min walk away from town. There were less animals than in Waitomo Glowworm Caves, but still enough to get the point across. Seeing the glowworms was a unique experience to me and I’d recommend you see them somewhere in New Zealand at least once. We did end up we extended our stay at the hostel due to the heavy rain. Spending our time inside the hostel and only leaving for the grocery store. At one point in the common area, a female loudly asked the people in the room if anybody was traveling by bus and heading to Franz Josef next. I spoke up since that was our plan and within minutes we had arranged to travel together. She had a car and we were going to contribute to gas money. She hadn’t seen the gorge or the lake yet, so we drove with her to those destinations. The lake was nothing special, but the gorge had amazing, turquoise water. A few boys were jumping off a bridge into the cold water. The horseflies in the area made us clear out after we snapped a few photos. Overall Hokitika is a cute place, but maybe not worth the trouble if you lack time. We had been on the go since we arrived in New Zealand and I enjoyed being able to rest in a nice hostel without doing anything and not needing an excuse because of the rain. I also didn’t need to worry about the $32 bus ticket anymore since we found a ride. Just kicked up my feet and watched movies. Rotorua has many things to offer, but we were only interested in 2 activities. One activity was zorbing, which was created in Rotorua. Zorbing is being trapped in a human sized hamster ball and rolling down a hill pathway. We got up early to be the first people at the OGO company, who do zorbing. We didn’t waste any time and went straight to the top, instead of sitting in a hot tub below for a while. Happenstance, a staff member needed to finish preparing our zorbing ball, so we ended up relaxing in a hot tub at the top anyways. While the guy filled lukewarm water in the zorbing ball, I wondered how often the hot tub water gets cleaned out and that I was thankful to be the first person testing out the water that day. The hamster ball was finally ready to go, we lunged ourselves inside, and the staff sent us rolling on the zigzag path. We were sloshing inside and constantly laughing, especially at the corners. The wind helped us speed up. We initially wanted to do dry zorbing (no water inside the ball), but the wind level would have thrown us off the pathway. Overall, zorbing is too expensive for what the activity was, but we wanted to try it out at least once. And it was fun! Next, we zipped over to the Wai-O-Tapu Thermal Park. We arrived right on time for the free tour. As we strolled through the park, we saw all kinds of colors created by nature. I was captivated by the colorful ground and water; everything from orange, yellow, green, and more. Though the place was pleasing to the eyes, the nose wasn’t delighted. If you are feeling gassy, then this place is where you want to go to release pressure undetected. The natural chemicals had many parts of the park smelling foul. Especially the sulfur that reeked of rotten eggs. I was happy to inhale refreshing air after leaving the park. A section of the Wai-O-Tapu Thermal Park. We didn’t check out the town at all, but drove to National Park. Our initial plan was to sleep here for 1 night and then hike Mount Doom (a mountain from Lord of the Rings) in the morning. This hike is considered the best 1-day hike in New Zealand. The park is free to enter as well, but after taking 7 hours to complete the one-way trip, the bus service to return to the beginning of the path or back to town charged $21. Outrageous! That’s a 30-min drive. $21? I don’t think so. Instead of throwing our money out the window or doing a smaller, free hike, we decided to move on to Wellington and spend an extra day there. Wellington was my favorite city in New Zealand. The city has this calm feeling. Maybe only because we arrived on a Sunday (which got us cheap parking), but the place is surrounded by the ocean and distant mountains. The citizens were lounging around the waterfront as if there were a festival. Overall just a great atmosphere. Part of Wellington's waterfront. Doesn't is seem peaceful? By the waterfront was the library. After utilizing the free internet at the library, we visited the Te Papa Museum. This free museum is a must go to place. It’s a huge building with many different exhibits. We spent few hours in here, but skimmed over half of the displays. Just too much to see in one sitting. The information was displayed in various, creative ways, which makes this museum one of the better ones I’ve ever been to. After our brains could no longer soak up additional information, we hiked up town to the Botanical Garden. This vast garden has a few sections, but I thought the playground there was awesome for children. There was even a zip line and I wanted to be a bully and shoo the children away so I could go myself, but refrained. We wrapped up our day with a dinner and on our way back to the parking lot, we happened to stumble across a firework show. Getting ourselves oriented in the garden. The following day, we stayed at the campsite and relaxed before we had to board the ferry to the South Island at 2:30am. The relocation car company paid for our fare. We didn’t realize that we weren’t allowed to stay in the camper below deck, but that everyone is required to move upstairs. Replacing the comfortable camper bed, we now had to settle in a padded chair. We also forgot to bring food and warmer clothing since a ferry staff urged us to exit the vehicle. So, I constantly woke up cold with a grumbling stomach. Exiting the ferry, we had a long drive ahead of us to Christchurch, where we needed to drop of our relocation campervan and pick up another relocation car. We didn’t spend any time in Christchurch yet, but took off to Takaka, where we plan to visit a park. That story is coming up next. We finally landed in the country considered one of the most beautiful realms on this planet. Our fatigue from the journey here could not dampen our excitement to explore the foretold naturistic amazement. However, the bus price from the airport to Auckland center worried us. Will our wallets be able to survive a place where a 45-min airport bus ride requires to hand over $12? New Zealand is not considered a cheap destination. In regards to Auckland, visitors and locals alike warn travelers not to waste precious time in this city. There is “nothing to do.” We took their words to heart, spent a free night at a couchsurfer's home, and had an evacuation plan for the morning. Through transfercar, we found a relocation campervan to Christchurch. What’s a relocation vehicle? That’s when a rental car company needs their vehicle at another location and lets mortals like you and I drive the car for free or dirt cheap, if lucky other perks (gas, tolls, etc.) are included as well. The only downfall is that the date range and amount of days are determined by the company; so, you’ll have to work around their schedule. The vehicle we scored was a campervan for $5 a day plus $75 since we added another day to the allowed days, but the company took care of the ferry ride from North to South Island. The first campsite spot in New Zealand. I have never driven a vehicle this size, so naturally I was nervous. Not to forget that Kiwis (New Zealanders) drive on the left side of the road. The money we saved by not buying bus tickets was enormous though. Also, we located free campsites throughout our trip, ensuring not to lose another $20 per night on accommodation. I’m not usually a fan of road trips, since I get bored of driving, but the winding roads with the fabulous scenery made the drive very pleasant. I loved the vast number of sheep the north island holds. Baaaaah! Fluffy clouds on 4 legs everywhere. Our first stop on our road trip was Waitomo. Our point of interest was the Waitomo Glowworm Caves. Just as the name implies, the place is a cave with glowworms. We had to book a tour for this. We gained new information about glowworms, but the best part was the short boat ride through the cave. Awe striking and tranquil (minus the noisy Chinese group further behind us). Because glowworms are sensitive to light, I couldn’t take any pictures for you. Imagine if the stars were blue and suddenly thousands of them were in reaching distance. The blue lights were stretching all along the cave walls, covering much of the ceiling. The splashing of the water dripping down into the water added that special touch of ambiance. At the end of the caves. This picture does not do the experience justice. Though I loved the ride, there are glowworms in other places of New Zealand (Hokitika for example). Those places usually don’t have the vast numbers of blue-shining creatures, but they are free. So, if you want to save money, those places might be a better option for you. Keep in mind that other tourists will be there, taking pictures and being noisy, even though the signs request the opposite since glowworms frown upon this and will temporarily stop glowing. Strolling out of the glowworm cave, we kept walking up a hill for a view point. Few people come up this way. The 15-min walk is worth the small effort though. Especially since we will be driving a little longer to get to Rotorua. The day was comprised of mostly sitting and our gluteus maximus thanked us for the change. At the free campsite, we didn’t want to walk around much either. Too many blood-sucking nuisances flying about. Although we did score a lovely spot right next to a lake and arrived just in time to view the sunset. The whole area around the view point is full of greenery. Thus far, the prophesied tales of New Zealand have lived up to their stories. This ravishing country allowed me to start a new chapter on travel, pushing me out of my comfort zone by navigating a larger vehicle, but in trade rewarded me with new found freedom. I urgently need to use the toilet? Now waiting hours for the next bus stop is history. No more pushing my bladder to its limits. We were only at the beginning of our journey here. What did the rest have in store for us? Up next was Rotorua, where I was trapped in a hamster ball.